Got this game last year and I throughly enjoy it. Lovely art work and design. It can play upto 6 players. Your aim is to go round the board first. But in order to do that you will need food and doubloons. Various places you have to pay either food or doubloons. If you don't have enough you will have to go back until you can afford the fee. Players roll the dice and determine what order the dice will go. Each player has three cards to choose from there hand you play. You either have the options of move forward/backwards gain food doubloons or cannon. Cannon is used when you land and finish on a tile that contains another ship you go into attle. Players decide how many doubloons they will add to the battle and roll the combat dice. When a player wins the battle they can either take what ever is in their hold or take a treasure card if they have one from the player. Treasure cards are earned when finishing on a square that has a treasure chest marker. The card can either contains an extra hold on your ship, cursed treasure or actual treasure. A great game but the only downside is the rule book which is set out like a map. Incredibly fiddly. We got this game as something to play with six players of mixed gaming experience on New Years Eve. This game fits ideally with that sort of group, there is a strong element of luck due to the die rolls and the available action cards you happen to draw for your hand, but its not so much that the more serious gamers feel that they have no control at all in their progress through the game. The game is great fun and it doesnt take long for players to get to grips with. The components are excellent, except maybe the rules which come on poster sized folded sheet, I can see their logic, they hoped that people could unfold it on the table and play straight away, but in my experience I did not have that much room and so had to struggle with opening up this huge sheet to consult the rules. The box itself has a wonderfully well designed insert with a place for everything and is designed to look like a treasure chest, so full marks for its production design. In conclusion an excellent family game. 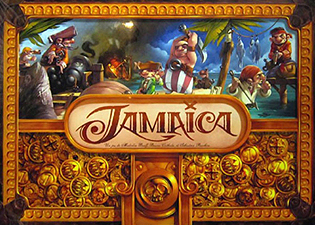 This is light family race game where each player is a pirate and has to race one lap around the island of Jamaica. However, this game is not only lots of fun, but is also something more than a simple roll and move game, thanks to the clever action cards that divides the turn into AM and PM actions. This is a game that can be played in less than an hour and has some really nice artwork as well as being a lot of fun to play, whether you play it as afamily game or as a light game during a gaming session.